1) When faxing or sending in your paperwork to your lender, make sure that your loan number is printed on every page you are sending in. Lenders received thousands of papers a day and sometimes the cover sheet gets lost or the fax gets misplaced. If you have the loan number on every page, they can make sure it gets in your file. 2) Make sure that ALL of the requested paperwork is included in the file. If you are missing just one required document, they will show your account is incomplete and your file sometimes goes to the bottom of the pile. 3) Follow up every week with your lender to make sure all of the documents they have are up to date. Don’t worry about being a pest; this usually keeps your file moving along. These tips are the same tips we use when submitting Short Sales. The complete packages move along much quicker then the packages submitted with missing documents. Some lenders even tell us to keep sending in pay stubs and bank statements so the file is kept current at all times. 1) Get Pre-Qualfied – you will need to find out what you can qualify for and obtain a Pre-Approval letter before going out to look at homes. 2) If you have marginal or bad credit, consult your lender –they will be able to advise you on whether your credit history will prevent you from qualifying for a home loan. 3) You will need a down payment – Down payment requirements vary depending on the type of loan. There are a few down payment assistance programs, but gone are the days of lots of ZERO down loans, unless you are a Veteran. Consult with a lender about the programs available in your area. 4) You will need funds for closing costs – In addition to your down payment, you may need to have additional funds for closing costs (i.e. Escrow, title, mortgage insurance, taxes, loan fees and fire insurance). 5) Some loans have “points” and some do not – A point is a loan origination fee equivalent to 1% of the loan amount. Together with the interest rate they constitute the yield on your loan for the lender. Some lenders charge a higher interest rate to compensate for charging no points. It is important to comparison shop lenders to make sure your loan is at a competitive yield. 6) Should you select a mortgage with a fixed rate or an adjustable rate? It depends on whether mortgage rates are at a high or a low point when you purchase, and on how long you plan to live in the home. If rates are low, a fixed rate would be more attractive and if rates are high, an adjustable rate might be attractive since subsequent rate drops could reduce your monthly payments. Also lenders may offer a low rate during the first few years of an adjustable mortgage to make it appealing to you. 7) Be aware of the two main type of loan categories – Conventional Loans and Government Loans (FHA/VA) . Both of these loan types are available with fixed or adjustable interest rates and some require mortgage insurance. 8) If you are a low or moderate income home buyer – there are some local and state housing agencies, like the California Housing Finance Agency(CalHFA) that have special loan programs available. 9) Why might I have to pay mortgage insurance? Generally, conventional loans that require larger down payments do not require mortgage insurance. Mortgage insurance is always required on FHA loans. Mortgage insurance protects the lender from potential loss if you should default on your mortgage loan payment. 10) Many organizations offer home loan counseling to prospective home buyers– These organizations provide classes for home buyers to cover the steps to home ownership. They will cover home selection, realtor services, lenders, loan programs, home ownership responsibilities, saving for a down payment, and other important pieces of information. Many first-time home buyer programs require home buyers to attend this type of class to be eligible for selected programs. According to an analysis of more than 25,000 loan quotes and purchase request on Zillow Mortgage Marketplace during the first half of September; almost 1/3 of Americans are unlikely to qualify for a mortgage because their credit scores are too low. They found that 29.3% of borrowers have a credit score less than 620. The lowest rates went to 47% of borrowers with excellent credit scores of 720 or above. Zillow Mortgage Marketplace quoted that during this period, borrowers with excellent scores got an average rate of 4.3% for conventional 30 year mortgages. Mid range borrowers with credit scores between 620 and 719 received rates between 4.73% and 4.44%. Those with credit scores below 620 received too few loans to calculate the interest rates received. For each 20-point credit score increase, the average annual percentage rate (APR) declines 0.12%. New data was released on 9/22/10 by Treasury and HUD on the Home Affordable Modification Program (HAMP). 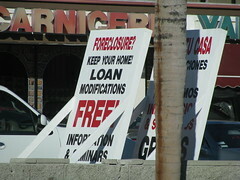 Just over 33,000 homeowners received a PERMANENT HAMP modification in August, 2010. This figure is down 27% below the number of PERMANENT HAMP modifications in July, 2010. The borrowers whom received the PERMANENT HAMP modifications have seen their mortgage payments drop by a median of 36%, or more than $500 per month. Homeowner’s who received these modifications saw their housing expenses fall from 45% to 31% of their monthly income. In August, 2010, 26,628 TRIAL HAMP modifications were added to the HAMP roster. Currently there are 202,521 active trial modifications. Federal officials are pushing the loan servicers to make decisions for borrowers who have completed the trial phase and either drop them from the program or make them permanent modifications. The Treasury stated that the most of the cancellations are due to insufficient documents received or missed or late trial payments. In addition, if their principal housing expenses are already less than 31% they do not qualify for the program.